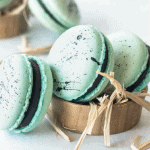 I am all about these Robin’s Eggs Macarons! And Easter!! Of course, I am all about Spring too! It’s here! Technically. It’s still pretty cold where I am. Upstate New York, enough is enough, get with the program and let Spring happen already!!! So, Sunday is Easter! April 1st 2018. But we are doing a Peter Rabbit theme, since Easter is the very next day. So I’ve been baking and going nuts over party favors, decorations, table cloths, and the whole thing! I am a planner by nature, so only fair I would be a huge party planner! Specially when it comes to my precious baby’s special day! Hopefully I can get some pictures of the yummy stuff I’ve been making. 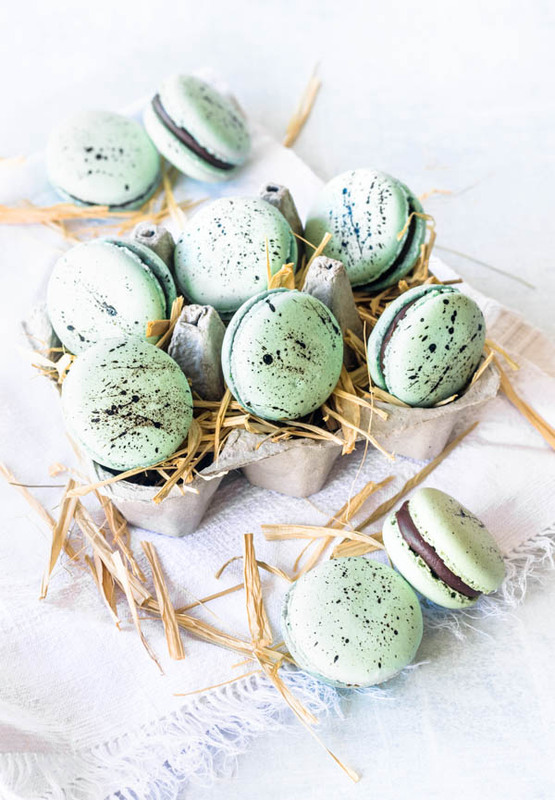 Either way, I am for sure serving these Robin’s Eggs Macarons at my son’s dessert table! The thing with macarons is that, they are easy to make, as long as you get a couple things right: the macaronage (folding the almond flour+powdered sugar together with the meringue), and the baking temperature/time. If you got these two things right, then you’re probably golden! 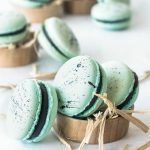 I wrote extensively (or at least a little bit) about those two factors on my post about Matcha Macarons. I will be posting more macarons posts soon, and I will revisit the tips and etc! But, for now, if you’d like some tips, please head on over to my Matcharons post! You won’t even be sorry!! My son’s party will be brunch style. So we will have quiches, finger sandwiches, pao-de-queijo (Brazilian cheese rolls), some sourdough bread, a charcuterie board, lemonade, iced tea, iced coffee. And also a beautiful dessert table, with macarons, coconut fudge, cheesecake dulce de leche balls, cupcakes, and a beautiful cake. Everything homemade!! For the favors, I made chocolate eggs, and little bags with some Easter toys for the kids!! I am super stoked! I hope it’s awesome! And I wish everyone an awesome Easter!! These are the perfect treats for Easter time! Share them with your lucky friends! 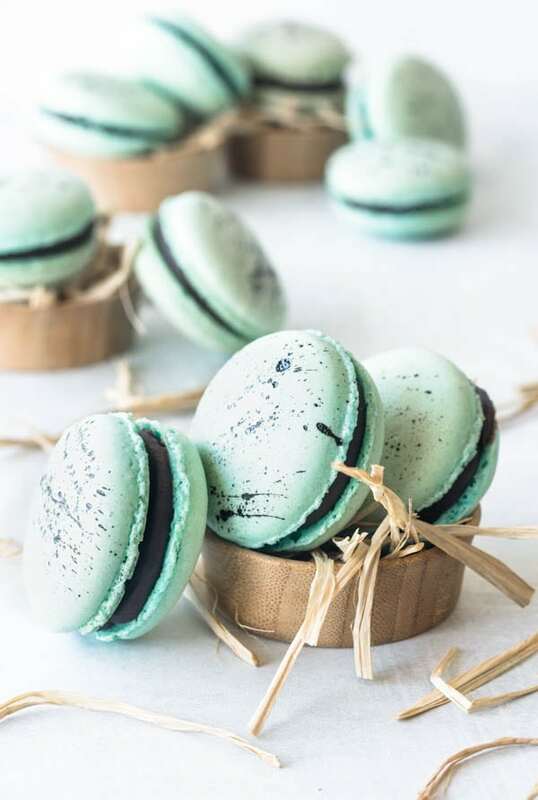 These macarons have a plain almond shell and are filled with delicious chocolate ganache! Before beginning, first make sure to measure out all of the ingredients. Second, leave 2 baking sheets ready, lined with parchment paper or silicon mat. I’ve printed a layout on my computer of 1 1/2” circles so I can pipe beautiful shells. There are also templates online you can print out, or you can even purchase silicon mats that already come with the circles printed in them. Leave a large piping bag fitted with a large round tip, all ready to go. Sift powdered sugar and almond flour together in a bowl and set aside. Mix whites and sugar together in a bowl or in a double boiler pan. I usually use my KitchenAid bowl, over a small saucepan of simmering water, where I also make sure the bottom of my bowl isn’t touching the water. Whisk whites and sugar over simmering water for about 1 minute. Remember, this water shouldn’t be boiling, it should be at a very slow simmer. Once sugar has been dissolved, you can start whipping the egg whites with the whisk attachment in your stand mixer. It will take about 3 minutes whipping on high, to obtain stiff peaks. You don’t want to underbeat the meringue, but you also don’t want to overbeat it. As soon as the meringue reaches stiff peaks, stop beating. Add sifted almond flour and powdered sugar. With a spatula, slowly fold mixture, doing a J motion. When you see that the dry ingredients have incorporated into the meringue, you may add the food coloring, if using. Keep folding, slowly, until you achieve the perfect consistency. This part right here is called macaronage. Once the batter seems like molten lava, it’s ready to be piped and baked. That’s what every other website out there says to describe the consistency your batter should be before you start piping it. Though, I think that’s a very broad way of describing the most important aspect in the process of baking macarons. So, there are a few more signs you should look for. First, the batter should be falling off the spatula in a ribbon, without breaking up. Second, scoop a little bit of batter with a teaspoon and spoon onto the baking sheet. Give it several seconds. If the batter is staying still with a point that won’t dissolve into the macaron, that means you probably have to stir a bit longer. So go ahead and give your batter a couple more folds. You don’t want to overmix your mixture either, otherwise your macarons will lose shape and be completely all over the place. You want to mix just the right amount. It’s a fine line and you’ve gotta find it. Pipe as many circles as you can and bang baking sheets against the counter several times, to release air bubbles that will cause your macaron shell to break. Let your macarons dry for 20-60 minutes, depending on how humid your house is. Bake macarons for 4 minutes. Rotate them. Bake them for another 4 minutes. Rotate them again if necessary. Bake for another 4-6 minutes. The macarons will be ready once their color is deeper and they have beautiful little feet. Heat heavy cream until just before it boils. Don’t actually let it come to a boil. Pour it over chopped chocolate and stir until all chocolate is melted. Make sure there are no remaining bits of unmelted chocolate in the ganache. If, after stirring for a long time, there are still pieces of chocolate in the ganache, stick it in the microwave for 5-10 seconds at a time and keep stirring until the mixture is 100% smooth. Let it cool down, and refrigerate it until ready to use. Put it in a piping bag, so you can easily pipe dollops of filling inside the macaron sandwiches. These Look really yummy! I have to try my hands on this recipe! Thanks for the in-depth instructions on how to make these! I will have to try them soon 🙂 Your photos are gorgeous, too! Thank you so much! so are yours!!! Yes macarons are the best! thank you so much!! These are the most cutest, fancy but simple Easter desserts that I’ve ever seen. I have never thought to make macarons before but you and your pretty cookies have inspired me to try them out. Thank you, April! I do hope you make some macarons! as they are delicious and beautiful as well! Homemade is always the best. I love your Robin’s Eggs Macarons. Egg and chocolates are my little girl favorite. I love to make this for her. Thanks for sharing. Gorgeous as always! These sounds super tasty, especially with that filling! And here in NM it’s already 86 degrees… I’m wondering where did Spring go! I need sunblock haha! DO you use a macaroon pad to get them perfectly sized? I like the one from LeKue. These are perfect in colour and styling and love the freckling on top as well. Genius! I totally should buy a macaron silicon mat. I actually just use a print out I made myself on my computer. But I have to keep printing them lol! That’s going on my amazon cart! These are so perfect for spring. I have never tried to make them but they are on my list of things to try. Thanks for the recipe! Macarons are def worth the try! How do you get the speckles on the shells? So this is how you do it. Put a few drops of food coloring in a little plate, then you grab a small brush and a fork. 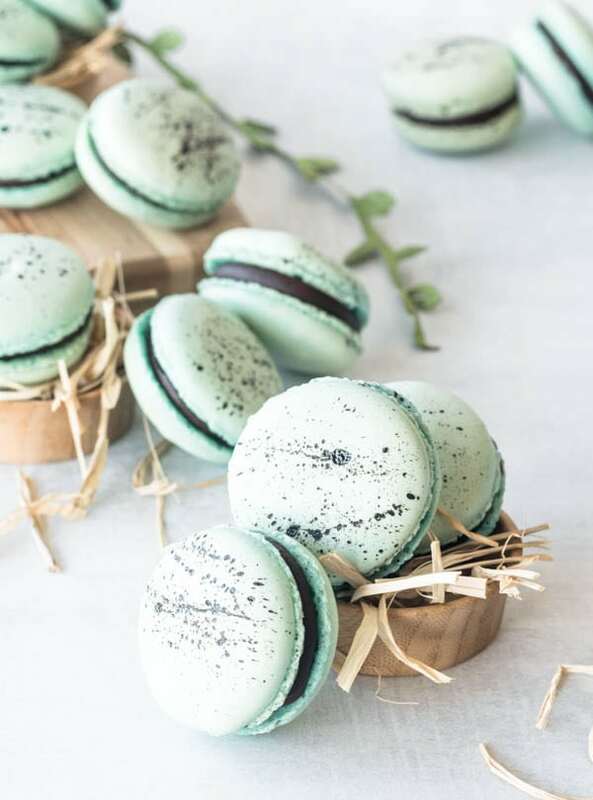 Place the fork a little bit away from the macaron shell, grab your brush, dip in the food coloring a bit, and run the brush against the fork in quick motions, so the food coloring will form the speckles in the shell! I should probably write this on the post, I wrote this a long time ago in the beginning of my blog haha. Thanks for your question Katherine, have a fabulous day!! !